But seriously, Kit Kat Bars have gotten a bad rap the past few years. 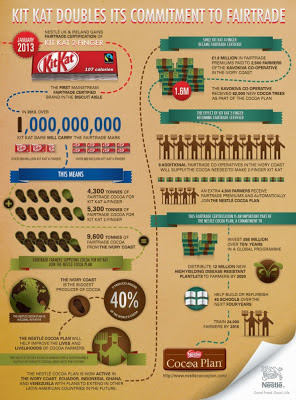 A media campaign by Green Peace in 2010 alerted the world to Nestle's use of palm oil, a commodity at the root of much recent tropical deforestation, in products such as Kit Kat Bars. This reputational smudge prompted, much as it eventually did for Girl Scout cookies, a shift in corporate commitments towards sustainable sourcing of palm oil. While large food and beverage companies use only a tiny fraction of total palm oil (most goes to biofuel right now), this sets a precedent for the other big players in the industry to follow. 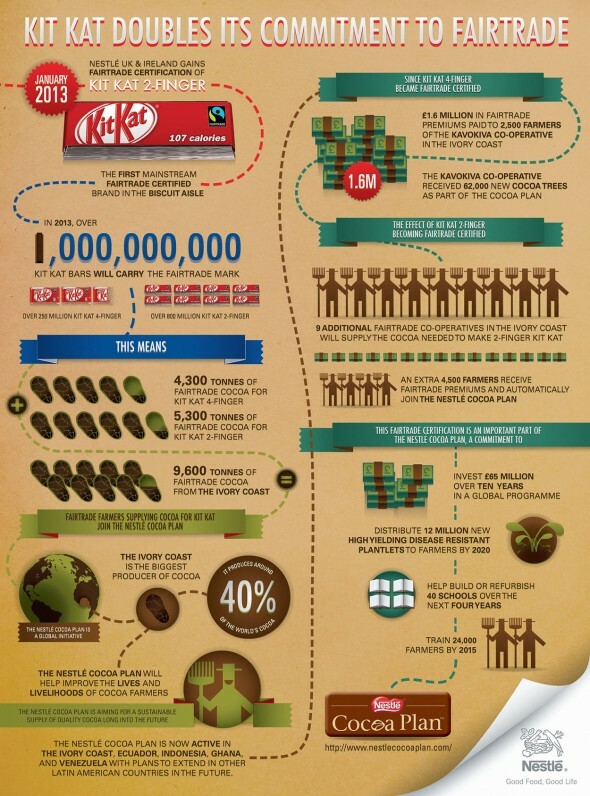 Now Kit Kat has taken another big step - certifying cocoa "Fair Trade" - in its West Africa sourcing area and set to expand into more of Latin America. The Nestle Cocoa Plan involves training farmers in sustainable practices, improving cocoa production, supporting new schools and community projects, and providing a price premium for farmers. Similar pressure from consumers prompted Coca Cola down the path to becoming one of the leaders in water stewardship. Ok, that's all. Signing off!